The Camino Phrasebook will give you some great phrases that can be used on your Camino de Santiago journey. As many of the Camino routes pass through different countries it is always a good idea to have some basic phrases in the languages of the country that you are walking through. For example, if you are planning to do the full French Way you will travel from St Jean Pied de Port in the French Basque region all the way to Santiago de Compostela in the heart of Galicia in Spain. On your way, you will be walking through villages and towns that may have no English speakers so it is great to have some general phrases in French, Spanish and Galician to help you along the way. 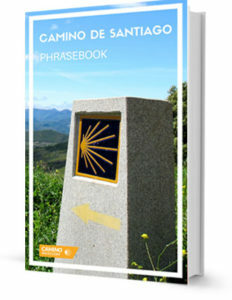 With our local experts, we have put together a free Camino Phrasebook that contains Camino specific phrases, basic directions and useful phrases in Spanish, Galician, French, Portuguese and Catalan. Depending on which route you choose to take our travel team will advise you on the language that could be needed for your Camino journey. * By downloading your free Camino Phrasebook you are agreeing to receive the CaminoWays.com newsletter.